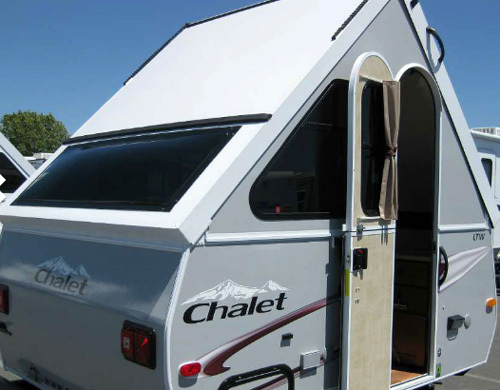 Chalet Inc. (Albany, Oregon) is one of American RV manufacturers known for its series of A-frame travel trailers. 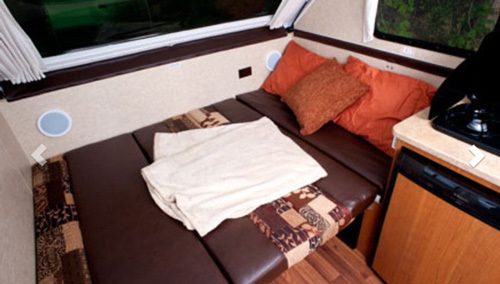 In recent years, these hard-wall folding campers gained considerable popularity thanks to their undeniable advantages. They are lightweight (so can be towed by almost any family car and fuel efficient), folding (so easy to tow on the road, maneuver on the campground and store in the garage), weather “resistant” and easy to set-up. The latter characteristics make the clear difference compared to tent pop-up campers. The main disadvantage of A-frame travel trailers compared to tent-ones is the sleeping capacity. Typically they are designed for 2 –to- 4 persons while tent pop-up campers can easily provide sleeping space for 6 (if not more). Chalet LTW travel trailer (here with an optional Front Roto-Molded Cargo Box). The series of Chalet’s A-frame travel trailers includes: LTW (smallest one presented in details below), Classic: models Alpine (L=15’6”, sleeps 4) and Arrowhead (L=15’6”, sleeps 3), and XL (length 18’7”): models XL-920 (sleeps 4) XL-1930 (sleeps 3) and XL-1935 (sleeps 2 in queen-size bed). 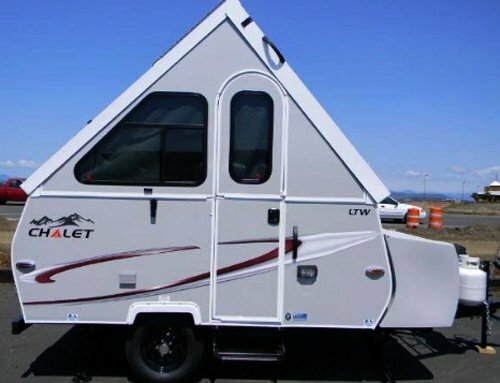 LTW travel trailers shares common characteristics of Chalet Inc. A-frame trailers. It is the lightest one and with its 1300 lbs dry weight it can be towed by most vehicles. Rot and corrosion resistant construction (vacuum-bonded floor with insulated laminate, powder-coated steel frame, aluminum, composite materials etc…) guarantee durability of the trailer and trouble-free operation. Smoked-tinted panoramic windows offer privacy but at the same time they allow to “feel the touch” of the surrounding nature. 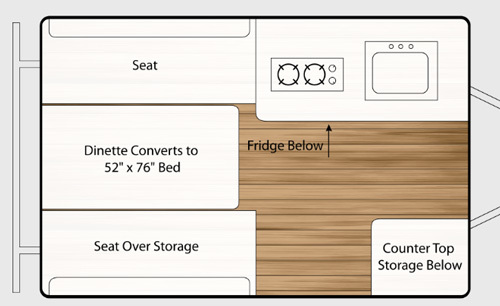 The dinette convertible to bed (76” x 52”) offers sleeping space for two. 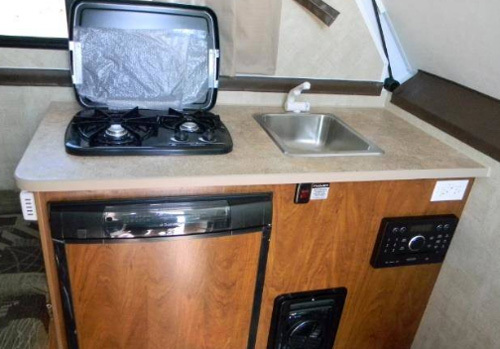 Despite the small size, the trailer includes decent kitchen with 2-burner cooktop, sink, refrigerator and countertop with storage below. Standard features include also the furnace allowing for extended use of the trailer outside of the summer season. Pre-wired system for solar power and an optional Trailboss Off-Road package offers the possibility to explore areas “outside of civilization (especially welcomed by enthusiasts of wilderness).